From @BalancingMama: Mommy & Me: Hats! We had some time to spare between an early dinner and the Super Why Live show on Friday night, so we stopped in a new Golfsmith Xtreme store. We found a perfectly-sized pink putter and let Amelia try her hand at some golf. 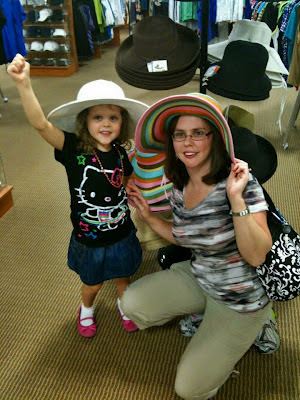 On our way out, she spotted a four-year-old fashionista's dream: a rack of big floppy hats. Of course we tried them on! Linking up to Mommy & Me Monday - get in front of the camera with your kiddos (or pets!) and come over and join us. Be Honest - and win something!